Two bored kids. Bored-out-of-their-minds bored. Fighting bored. There’s nothing but dusty old books in Grampa’s house. But when Grandpa opens a secret door in the bookshelves, brother and sister fall into an adventure they never expected, one that will change them forever. That is, if they survive it! Come along on this wordless adventure and experience for yourself the magic and power that can be found between the covers of a book. This wordless book begins perfectly, with an image of two bored siblings fighting on the sofa in Grandfather’s study while he looks on morosely. Then he opens a secret door leading to a cobwebby attic where a mysterious tome awaits: like characters in a wittier version of the Magic Tree House series, the brother and sister fall through the pages and into perilous adventures involving snow monsters and pirates. We get the message, and so do they. Wordless picture books were a popular trend when I opened shop in 1982. They have continued since on what I would call a lesser degree. However, a new and exciting wordless book is now available. 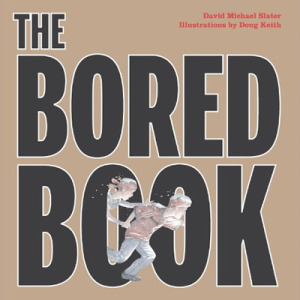 THE BORED BOOK by David Michael Slater, illustrations by Doug Keith (Simply Read Books, 2009, $16.95) opens in a living room scene where an adult and two children are spending an afternoon. The adult is quietly reading as the two children are engaged in physical play. The adult moves a bookcase exposing a set of steps. The children scramble up the stairs to find them selves in a dusty attic filled with bookshelves. When the children take THE BORED BOOK from the shelf the black and white illustrations turn to color and the adventure begins. When they have experienced a series of harrowing adventures, the children return to the first room with the adult. Now they find the books of the adventures they have experienced. Books like TREASURE ISLAND and THE HUNCHBACK OF NOTRE DAME. The artwork here is spectacular and sweeping in its scope. The dream sequences are one part frightening but more mystical in nature. They compel the reader to turn the page anticipating and questioning, what’s next? A most satisfying read, believe me.